Can I still just leave the card at 1080 rather than 4K? You really need to read the link provided. It has all the answers. 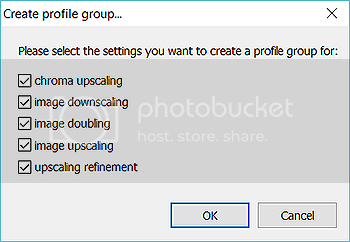 Select the Scaling folder. 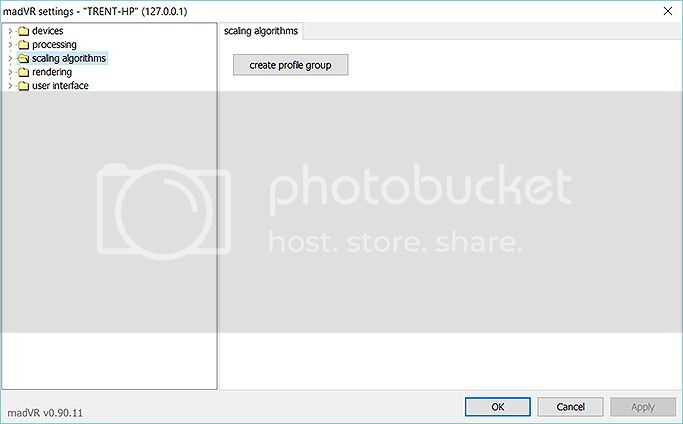 Using add profile, create six profiles. Name each profile: 1080p25, 1080p60, 720p25, 720p60, 540p25, 540p60. if (deintFps <= 25) and (srcWidth > 1280) "1080p25"
else if (deintFps <= 25) and ((srcWidth <= 1280) and (srcHeight > 720)) "1080p25"
else if (deintFps > 25) and (srcWidth > 1280) "1080p60"
else if (deintFps > 25) and ((srcWidth <= 1280) and (srcHeight > 720)) "1080p60"
else if (deintFps <= 25) and ((srcWidth <= 960) and (srcHeight > 540) and (srcHeight <= 720)) "720p25"
else if (deintFps > 25) and ((srcWidth <= 960) and (srcHeight > 540) and (srcHeight <= 720)) "720p60"
if (srcWidth > 1280) "1080p"
else if (srcWidth <= 1280) and (srcHeight > 720) "1080p"
if (deintFps <= 25) and (srcWidth > 1920) "2160p25"
else if (deintFps <= 25) and ((srcWidth <= 1920) and (srcHeight > 1080)) "2160p25"
else if (deintFps > 25) and ((srcWidth <= 1920) and (srcHeight > 1080)) "2160p60"
else if (deintFps <= 25) and ((srcWidth <= 1280) and (srcHeight > 720) and (srcHeight <= 1080)) "1080p25"
else if (deintFps > 25) and ((srcWidth <= 1280) and (srcHeight > 720) and (srcHeight <= 1080)) "1080p60"
Change deintFps > 25 to whatever you deem necessary. Last edited by Warner306; 18th January 2017 at 22:26. Thanks for that Warner, it certainly makes it easier to learn. Can you tell me what uses more resources, 1080p @ 60 or 480 @ 60? So you mean without using profiles? You can set that up under "Display Modes" in Madvr. The higher the resolution the more resources used. Also the higher the FPS the lower you're settings should be. 1080@30 you can use fairly high settings with most modern GPU's, 1080@60 and even a Titan X struggles when you start bumping up the settings. curiosity ... madVR using the settings of the VPR / Tv affecting the image detail keep them to zero? Hello Madshi, is it possible to implement HLG (Hybrid Log-Gamma/ARIB STD-B67) in your HDR to SDR conversion? I'm experiencing strange issue with Madvr, a red vertical line, this happens fullscreen only with this movie, but with others i've it in th preview with MPC BE, if i disable Madvr red line disappears... what is causing the issue? With this movie i'm experiencing lagging in the video, first time this happens with a movie. I'm on Intel i5-4590 and MSI R9 270X 2GB. Last edited by steakhutzeee; 19th January 2017 at 21:04. The default DAR aspect ratio setting doesn´t work here. So I tried 16:9 and Assume square pixels (SAR). Both seem to work. Wild guess, it is a interlaced 60i movie and madvr is asking the GPU to do dxva deinterlacing, which make everything go through the GPU processing. I am not sure everyone s consent on deinterlacing method, but I personally had switch everything interlaced to Weston complex in lav video to avoid thing going through GPU processing. I have the problem with latest (though not sure for how long, maybe a year) versions of madVR: in MPC-HC (latest stable release) if I go fullscreen and right click (for options) the screen goes black and mpc starts hogging up the memory (~4 GB) and using 60% of the CPU until I shut it down from Task Manager. 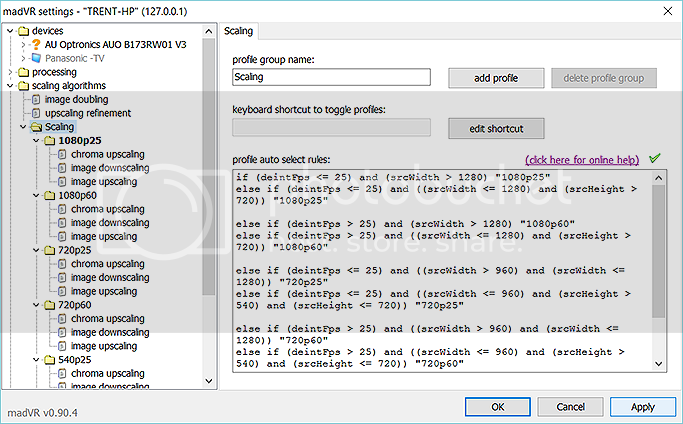 Using EVR, ir right-clicking in windowed mode is fine. Is this a known issue with madVR/mpc-hc? Last edited by flashmozzg; 20th January 2017 at 23:09. FPS output is 60 fps though sometimes it went up to 300. Check powersaving "mode" in Nvdia CP. Make sure it's not on "optimal" : set to "adaptive" instead. I'm also having a huge issue with Nvidia (GTX 1070). In FS exclusive I'm getting no actual dropped or delayed frames or presentation glitches, but I'm getting extremely noticeable stutter. Rendering time is something like 35ms, not the ~41 at which you start seeing problems. Windowed mode actually reduces rendering time by about 10ms and eliminates the stuttering. I've got my card at full power for mpc-hc, and it's happening in hi10p videos. However, this only happens with NGU Very High. With NGU set to High instead, rendering times are ~15.5ms for both exclusive and fullscreen, and no stutter. Last edited by derpycat; 21st January 2017 at 00:03. Thanks so much for the awesome software - it's truly world class. 2. If it's possible to detect scene changes (not sure - don't think a simple wait for an I-frame would do) it would be great to initiate zoom on a scene change so it's not noticeable to the user. This way movies that change aspect ratio (eg. IMAX titles like Interstellar/The Dark Knight) could become a seemless blend of full-frame and zoomed content. Find More Posts by fuzz! Did latest Windows 10 update (14xxx) break NNEDI support? Madvr reverts to Jinc if I choose it. Big Windows updates tend to mess with your drivers. Try reinstalling the latest drivers for your graphics card. Anyone here got a Kaby Lake iGPU and could test NGU Low + Bicubic AR 60 on 1080p to 2160p?